BERLIN - The saying there’s no place like home proved to be true for John Abbott. 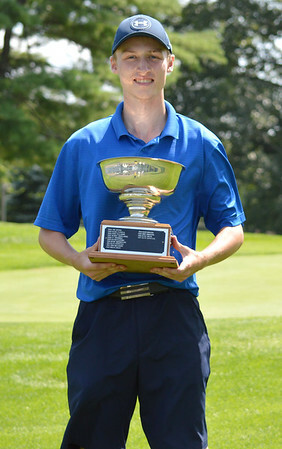 On Wednesday, the 22-year-old Western New England graduate produced a masterpiece at Timberlin, his home course, with a 2-under 70 to win the 33rd Connecticut Public Links Championship by three strokes over 2016 champion Kyle Nolin of Middletown. Abbott shot a 69 (-3) in the opening round. Only Abbott, Nolin, Alling Memorial’s James Sheltman and Norwich’s Josh Cameron finished the 36-event under par. And only five players in the field of 31 broke par Wednesday, when pins were tucked and soft conditions yielded few birdies over the almost 6900-yard layout. Abbott made five, three of them coming on the difficult back nine, where, for the most part, scores ballooned. Abbott got to 7-under before a three-putt bogey on hole 15, but Nolin and Sheltman, playing in the group of head of him, started to pick things up as well. Nolin reached 3-under for the tournament on 14, while Sheltman got it to 2-under there as well. But Abbott’s birdies on the par-5 13, and on 14 ended any chance of a Nolin and Sheltman comeback. It was a much different result than it had been earlier in the day. Abbott shot 39 on the front nine and finished with a 29 on the back. But even with the rough start, Abbot blocked out the rest of the field and turned his focus to making birdies. And in the end, he came away with the trophy. Posted in New Britain Herald, Berlin on Thursday, 16 August 2018 21:21. Updated: Thursday, 16 August 2018 21:24.